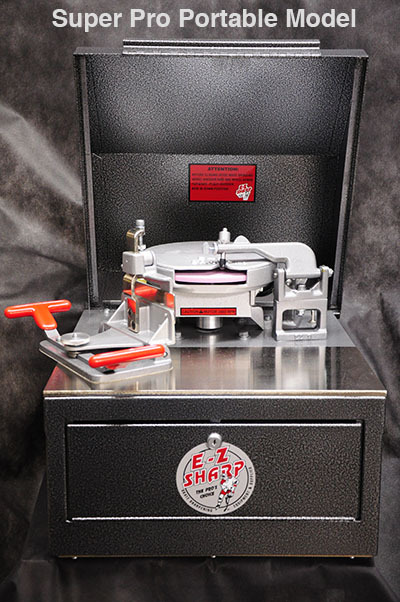 E-Z SHARP SUPER PRO PORTABLE MODEL: Includes a welded, reinforced steel cabinet and attractive sturdy metal locking top. No need to worry about throwing hockey bags and equipment around with the Portable E-Z Sharp machine. All machines come in either a 7″ or 8″ model. This refers to the size of the wheel housing and the size of the wheels used for sharpening. An 8″ wheel is larger and will sharpen more skates. All machines include the Quik Action Skate Clamp, nickel plated, heavy duty table with micro-fine finish for the ultimate in smooth grinding. Gel-coated carrying handles make travel easy. A locking storage compartment gives you added security. Your machine comes with a grinding wheel, diamond dressing tool, and a training video. A convenient and economical way to try an assortment of precision balanced grinding wheels. This kit gives you the advantage of knowing which wheel works best in your skate sharpening environment. Included in the starter kit: 3 wheels (of choice), 2 quality diamond dressing tools, 1 E-Z Sharp Wax Stick, 1 E-Z Glide Pad, 1 hand hone (of choice). E-Z Sharp Skate Sharpening Machines are precision tooled, designed for speed, efficiency, and safety. All machines & equipment are made in the U.S.A. Performance tested through years of service with Pro teams, Arenas, Sporting Goods Stores, Professional Ice Shows, High Schools, Colleges & Universities has earned E-Z SHARP a reputation for outstanding service and reliability. Large heavy duty coated handles for ease of portability. Welded, reinforced steel cabinet construction for lasting durability. Housing leaves less than 10% of grinding wheel. Skate is fastened in seconds, with unfailing accuracy. Wheel is dressed easily and quickly to insure perfect sharpening every time. Easy adjustment for choice of hollow. 1/3 hp. motor gives 3450 rpm’s for longer wheel life and faster operation. Stores skate clamps, grinding wheels, hand hones, wax, etc.